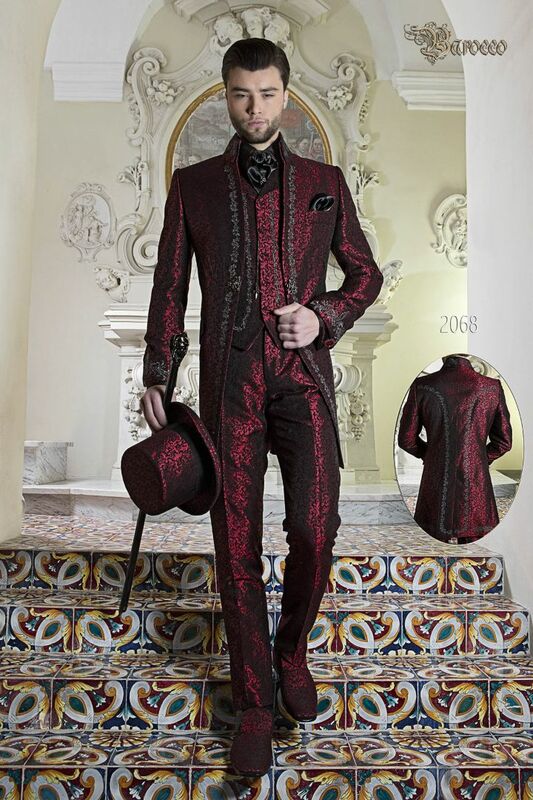 Dust coat for luxury groom in red brocade fabric with Napoleon collar and silver tone embroideries on collar, front, fla... Dust coat for luxury groom in red brocade fabric with Napoleon collar and silver tone embroideries on collar, front, flap pockets and sleeves. Jacket with straight hem and single vent at back. Redingote-style seams to stylize the figure, roll sleeves with sewn fold overlay, pointed pockets and single patterned frog closure. Length of jacket is typically suitable from the groom. Shirt made from black satin with red floral embroidery on the collar and cuffs. Concealed placket with buttons. Pointed ... Shirt made from black satin with red floral embroidery on the collar and cuffs. Concealed placket with buttons. Pointed convertible cuffs with patterned button and twin cufflinks buttonholes.